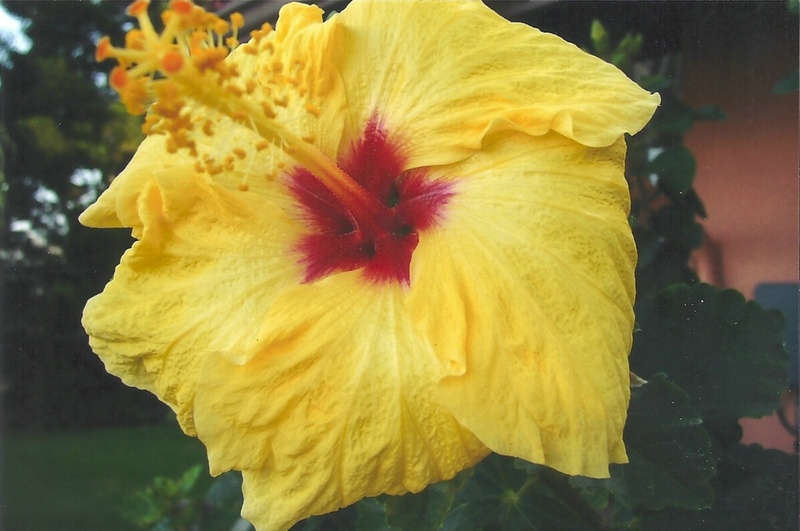 I said we were going to talk about Hawaii in this blog, and I thought that was going to be “easy.” BUT, I can’t figure out where to start!!! Going with people who’ve not previously been to Hawaii is always fun for me, because: we get to do things we did the first time we came, but maybe haven’t done since. OR, we get to do things we do every time, but they seem fresh and exciting, because they are fresh and exciting to someone! It’s about 95 miles from the North tip to South Point, 80 miles from east to west, and has 266 miles of coastline. Take a look at the map. Without reading labels, you should be able to pick out which island is the Biggest! That’s the one we are visiting. The oldest volcano on The Big Island (there are 5 main volcanic mountains that make up the Island) is Kohala, the northern most mountain. It is estimated to be about a million years old, but reached the surface of the water around 500,000 years ago, and the last estimated eruption was around 120,000 years ago. It’s 5,480 feet (1,670 meters) above sea level, and it’s about 5.8% of the land area of the Island. It is considered “extinct”, which means that it will (supposedly) never erupt again. Mauna Kea is considered “dormant”, which means that it hasn’t erupted in the past 200 years (“historic” times), and probably won’t erupt again. 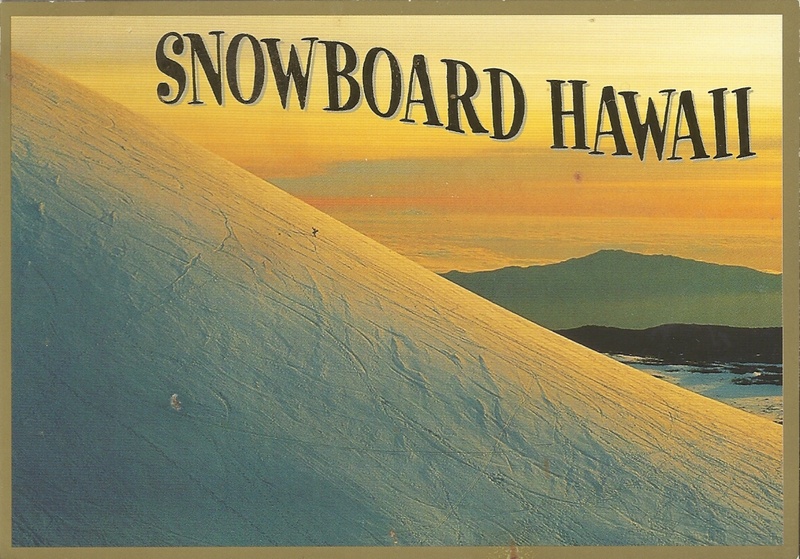 Mauna Kea is 13,796′ (4205 meter) above sea-level, and the ski hill is at the summit. In fact, Mauna Kea (measured from base to peak) is the tallest mountain on Earth, at 33,476 feet (10,203 meters)!!!! (Mount Everest is 29,035 feet (8,850 meters).. I probably won’t sled. It seems cold. BUT, I’d like to see it. 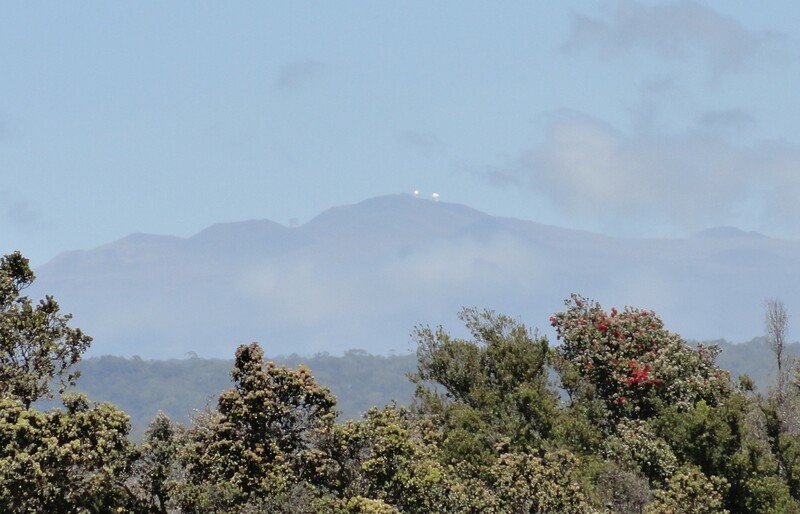 Also up on Mauna Kea is the Onizuka Center for Astronomy (also called Hale Pōhaku, which means “stone house”). They have free stargazing every night! (Yes – this is definitely on my to-do list.) The Center is at 9,300-foot (2,800 m) above sea-level, and it’s suggested/recommended to spend time there to acclimatize, before ascending further. 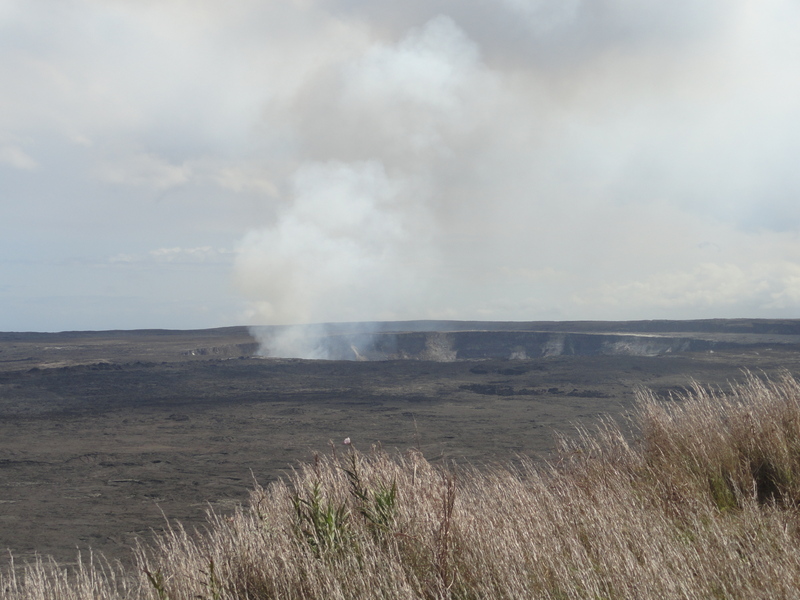 Hualalai is the Big Island’s oldest “active” volcano, meaning it has, at some point, in the past 200 years. Hualalai’s last eruption was in 1801. The oldest rocks of Hualalai date back about 128,000, but it’s estimated to have reached the ocean’s surface around 300,000 years ago. It is 8,271 feet (2,521 meters) above sea-level. An eruption is predicted for sometime in the future (in the next 100 years, I read), but is carefully monitored by the Hawaii Volcano Observatory… Hopefully, if anything happens, it’ll be a mild and peaceful eruption… like, a breaking through the surface and a trickling stream down the side…where nobody lives…heh. 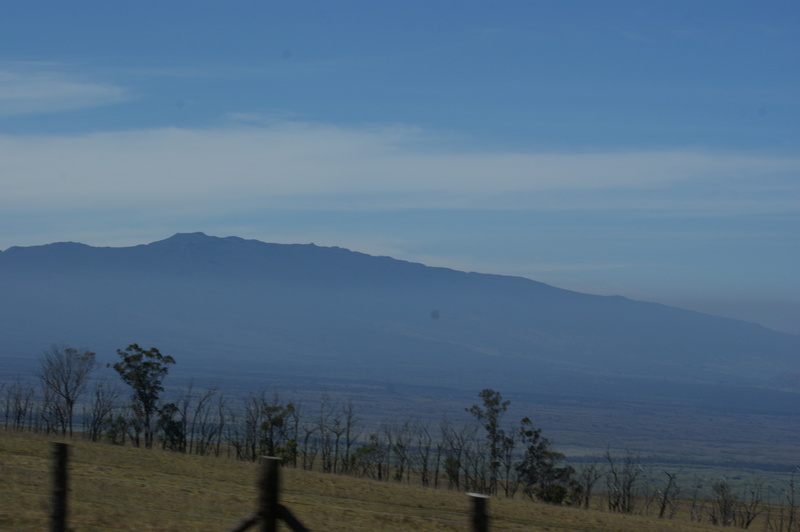 Mauna Loa means “Long Mountain”. This is a great name! It’s HUGE and has the title of being the “Earth’s Largest Volcano“!! 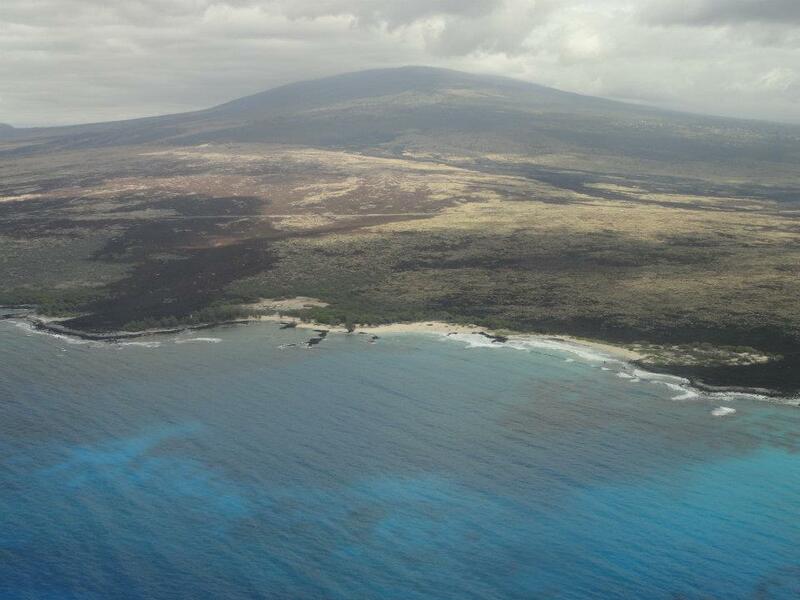 It makes up 50% of the total land base for the Big Island. It’s 60 miles long, 3o miles wide, and 13,681 feet above sea-level. It’s below the ocean’s surface by about 5 kms AND THEN! Because it’s soooo huge and heavy, the sea floor has depressed another 8 kms!! So, technically, it’s summit is around 56,000 feet (17kms) above it’s base!! Yikes! Mauna Loa is estimated to be about 1,000,000 years old, but didn’t reach the ocean’s surface until maybe 400,000 years ago, and the oldest rocks are estimated to be in the 100,000 year range. The last eruption was 1984, and is expected to erupt again…someday. As discussed, volcano’s are categorized as “Extinct”, “Dormant”, and “Active”. Personally, I have a fourth category: “REALLY Active” – those that are erupting right now! There’s probably an official term anyway, but I didn’t happen across it. “Really Active” is Kilauea, possibly earning the title as “most active” in the world. Although it looks like it’s coming from Mauna Loa, it is actually it’s own volcano. 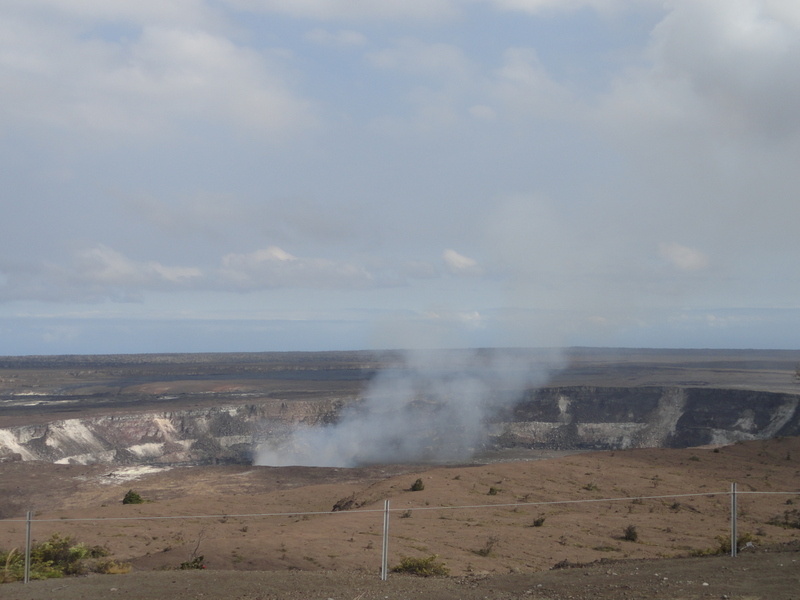 “Kilauea” means “spewing”, which is appropriate since it’s been erupting non-stop since 1983. It’s estimated to be between 300,000 and 600,000 years old, and having reached the ocean’s surface between 50,000 and 100,000 years ago. The oldest rocks date to around 23,000 years old. It is currently 4,190 feet (1,277 meters) above sea-level…the Pu’u O’o Vent (the current erupting point) is a “cinder-and-spatter cone” and lava from it flows through Lava Tubes into the ocean, so it isn’t really gaining height at all, BUT about 500 new acres of land have been added since 1983 . 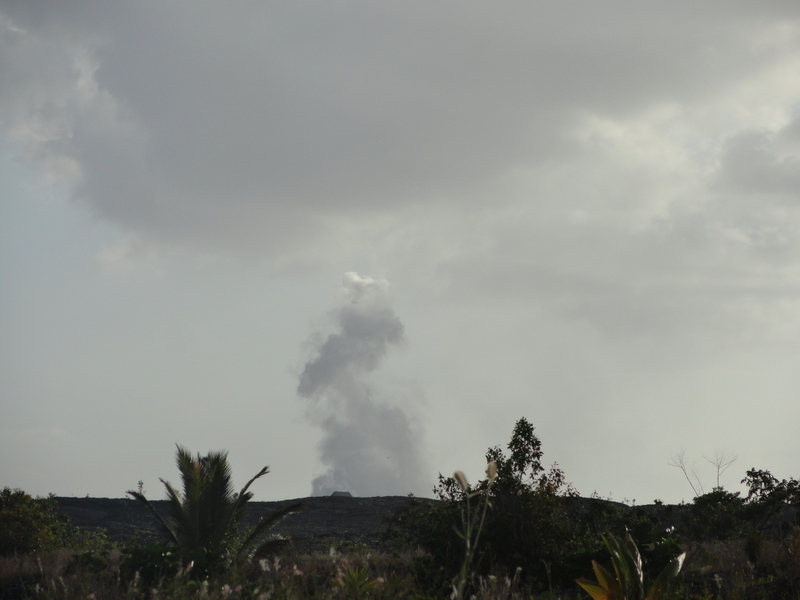 You can see the steam from Pu’u O’o as the lava comes down the mountain and a big plume where it reaches the ocean! Technically, you can hike to get a closer view, but it’s very strenuous and can be dangerous – so do aLOT of research and double check conditions with the Park Rangers at Volcano National Park. Before I go today, though – I just want to talk about one more active volcano – a “brand new” little up-and-comer – Lo ‘ihi. I’m not sure when it first started erupting, but it reactivated in 1996. It is currently about 931 meters tall on the north side, and 3,786 meters on the south side, since it’s growing on a slope.